As a teacher, I believe in striving to learn from my mistakes. I also believe in the power of international travel and of service-learning. Done well, they can become life-changing, enriching experiences for students. Done poorly, they feed into the Ugly American tourist syndrome. What follows is part of my self-reflection on a study abroad program in New Zealand that I helped lead in (our) winter of 2014. My essay, titled “Fossicking the Ten Essentials,” was published June 2015 in Traveler’s Tales/Tales-toGo. I’m about to embark as a leader on a ‘take two’ service-learning study abroad program in New Zealand and hope to have learned from my mistakes. I plan to publish a series of blog posts about our progress (while, of course, protecting student identities). The Ten Essentials: A term coined in the 1930s by The Mountaineers Club in Seattle for a list of necessary equipment to take on hikes. Updated in 2003 to the functional systems approach used as the headings in this essay. Using Google Earth instead of a compass or celestial navigation, my current location is 43.4 degrees South and 170.18 degrees East. High noon. 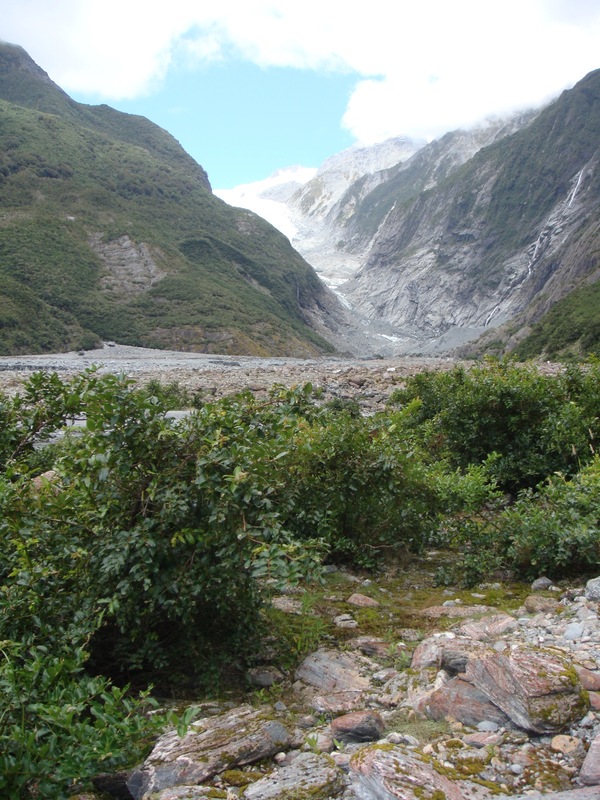 Franz Joseph Glacier, at the foot of snow-capped Aoraki/ Mt. Cook, South Island, New Zealand. I’m sitting at the bottom of a huge rock and ice slide at the terminal face of the glacier where its melt waters run into the Waiho River. The sun is out and there’s no breeze in this deep canyon dug by the glacier. It’s January 2014, high summer here in the land of the Southern Cross, so it’s warm enough to take off my jacket. There seem to be no bugs—no biting flies—no mosquitoes—and no birds to be seen or heard. Feathery waterfalls are cascading down thousands of feet from the sheer cliffs surrounding the canyon. The smell is elemental, metallic. All surfaces my body touches are gritty, covered with the fine glacial flour that turns the river waters to milk, that turns my skin to alabaster, that crunches lightly between my teeth, tasting of bitter iron. The rocks at my feet are newly fractured, jagged, split open quartz crystals of dazzling white and pale green. I pick one up and gaze into it like a crystal ball, considering its history—considering my history—and considering how it is we came to meet here at the foot of an ancient glacier. Then I become aware of the sound of rocks skittering down from the top of the pile behind me. I will myself to stay, but I turn so I can keep an eye on the rocks. I’m aware of the folly, knowing I could never run fast enough to escape being buried when the rock and ice pile finally gives way. I’m on the supposedly safe side of the yellow rope barrier put up by now absent park rangers. As the sun heats the valley and the rocks begin to fall more steadily, I decide to walk back out of the canyon. I retreat from the rock pile because I’m leading a group of fourteen young women, college students from Seattle on a study abroad program. I’m responsible for their health and safety for the three months we’re touring New Zealand. I lead them away from the glacier, back into the primeval temperate rainforest of towering tree ferns and vines. The steady din of cicadas and the occasional tremulant trills of bellbirds and tui envelop us. When we’ve returned to the forest path, I tell the students I’ll meet them back at the van in a few minutes. I duck down a deserted, quiet side path for a few moments of peace—away from the students’ raw enthusiasm, raucous singing, and selfie-picture-taking in front of every scenic view—including the rock pile of the retreating glacier. As I’ve driven them around the South Island in a mini-van, some have taken to yelling out the van windows “Hey cows!” or “Hey sheep!” to scare the herds and then laugh hysterically. Those are the Biology majors, a fact I find ironic. I was a Biology major thirty-odd years ago. Was I ever that young? On this study abroad program I’m ostensibly teaching community and environmental health, but what I really want to teach is the value of travel as critical self-discovery. Not the navel-gazing, bathetic sort of self-discovery, but rather the sort that leads to greater knowledge of and tolerance for uncomfortable aspects of ourselves and of people we view as “different” from us. I want to expose the students to the deep satisfaction of getting past being picture-taking tourists, instead, becoming travelers, perhaps even pilgrims walking towards the far horizon to arrive home. It isn’t working out well. So far, halfway into our trip, it’s more like a case study of how not to lead a study abroad program. We’re traveling around so much it feels like we’re never here, in New Zealand. Staying in ten different cities and villages in as many weeks, passing through and ticking off the have-done-have-been-there bragging list of photo-ops, skydiving, and bungee jumping: I feel more like an adventure tour guide (and an emergency room nurse) than a teacher. It’s not helping that we’re staying in youth hostels full of international backpacking nomads who proudly proclaim they have “done Franz Joseph,” they have “done Milford Sound,” they have “done Rotorua,” as if these are all colonial conquests—places and natives and experiences to be possessed and bragged about. But I signed onto this program late and had little hand in its design, so I’m trying to make the best of it. As we drive and tour and wander, I ask myself: Do we discover more about ourselves through movement or through rootedness to one place over time? If, as Lucy R. Lippard contends in her book The Lure of the Land, “space” is passing through coordinates and “place” is pausing to make meaning of the space, does it follow that space is to tourism as place is to travel? And if so, what is essential for the work of transforming space into place, tourism into true travel, into pilgrimage? Posted on August 18, 2015 August 19, 2015 by josephineensignPosted in UncategorizedTagged Community health, community health nursing, cultural humility, environmental health, international study abroad programs, service-learning, teaching. Brilliant. Looking forward to more….